As you can see I have to introduce blanc spaces "by hand" typing "\ ". I would like to be able to introduce spaces just hitting the bar (the same way as when inside a \text box). There is no way to introduce mathematical symbols. 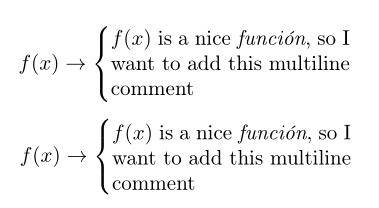 For example if instead of "This is a nice function..." I want to write "f(x) is a nice function...". I would like to have the possibility to introduce the characters áéíóú because I typically write in Spanish. This is also being impossible with my definition. Not the answer you're looking for? Browse other questions tagged lyx parbox or ask your own question. Can I change the space bar behaviour in LyX math mode? Basic principles: How to make Lyx more keyboard-friendly? What is the best Module/Approach for writing about Algorithms in LyX?